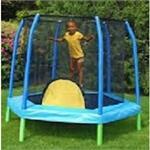 This parts section is for the different JumpKing Trampoline sizes and models. ONLY JumpKing Trampoline Replacement Parts are in this section! This section includes Jumpking trampoline parts for the arched / unibody pole style and the independent / straight pole style.